Manchester City beat Liverpool 2-1 on Thursday night to blow the Premier League title race wide open as we head into the second half of the 2018/19 season. Jurgen Klopp’s league leaders still hold a small advantage over last season’s champions, sitting top of the table, four points ahead of Pep Guardiola’s men in second. 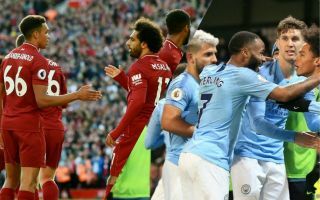 Tottenham will feel they are also in the running, but for now we’re taking a look at the key fixtures Liverpool and City face as they are surely the two big favourites despite Spurs’ efforts. Liverpool’s last remaining away fixture against a big six side – something that’s sure to benefit them over the next few months. Still, with Manchester United looking a totally different team under Ole Gunnar Solskjaer, this will not be as easy a task as their recent win over the Red Devils at Anfield was. The start of a hectic schedule for City, this should be one of the more winnable games for Guardiola and co., though Arsenal are capable of springing a surprise. Eight days later Chelsea are the visitors to the Etihad Stadium and will no doubt be tough opponents who beat City 2-0 at Stamford Bridge earlier this season. And then just six days after that, City travel to take on United at Old Trafford. While anyone can beat anyone in the Premier League and we have no idea what state the table will be in by mid-March, one imagines City will have to take at least seven points from these three games to have any hope of catching Liverpool. This will be a big one, especially if Tottenham can keep themselves close to the big two. But even if not, they’re bound to have some say in the title race as they travel to Anfield. April 27th 2014 was the day Liverpool threw the title away at home to Chelsea, and almost exactly five years later they’ll be wary of doing the same thing again. Thankfully, no Steven Gerrard to slip at the crucial moment for them this time, but this will be a hugely challenging fixture at a crucial point of the season, with just four games remaining after this one to ensure a smooth race to the finish line. A fourth test against a big six team for City, they’ll host Tottenham on April 20 and have just three games left after this.